There was only ever meant to be one Creator. In 1972, German scientist Renner Scholz travels to Barbora Bay, Washington where he meets the love of his life, Milena Nowak. Only believing in things proven by science, he becomes obsessed with determining the underlying genetic basis of Milena’s psychic gift. Stumbling upon an occult ritual, Renner is connected to the spiritual realm where he discovers an unrivaled power that fuels supernatural abilities. But, the answers he’s been searching for come at a cost—his soul. Driven by new darkness that resides within him, Renner has a breakthrough in his research—able to genetically produce psychic abilities in humans. Milena helplessly watches as her husband becomes deceptive, volatile and both physically and mentally more powerful. Can Milena save Renner from this evil presence? Or will she become an unwilling participant in his next experiment—one of the darkest kinds? Lanie Mores resides in Ontario with her family, although she enjoys traveling to alternate realities through reading, binge-watching Netflix or playing video games. She has worn many hats throughout her life: cashier, medical records secretary, psychotherapist, hypnotherapist, personal trainer, mom and now author. 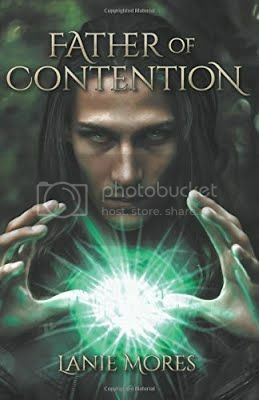 Inspired to write by Stephen King, Diana Gabaldon, Jean M. Auel, and Margaret Atwood, Lanie works diligently to complete her four-part FATHER OF CONTENTION series. With her writing, Lanie hopes to inspire her readers to think and live outside the box, to be courageous in following their own passions, and live a life of purpose.